Good Shepherd Housing and Family Services will honor Alphonso Jackson, former U.S. Secretary of Housing and Urban Development (HUD), with its inaugural Public Service Award at the annual Transforming Lives Gala on Saturday, April 9. The award honors public officials for outstanding and impactful public service actions that have furthered the mission of Good Shepherd Housing in combating homelessness and improving the lives of people in need. 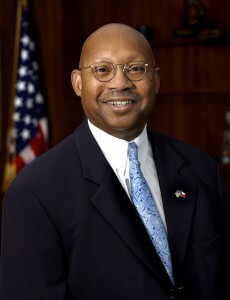 After serving as director of the U.S. Department of Public and Assisted Housing for Washington, D.C. and president and CEO of the Housing Authority of the City of Dallas, Jackson joined HUD as its deputy secretary and chief operating officer in 2001. He served as the secretary of HUD between 2004 and 2008. During his tenure, HUD reported an 11.5 percent reduction in the number of persons reported as chronically homeless in its annual one-day count of homeless persons nationwide. As a result of his leadership, the US Government Accountability Office removed HUD from the government’s “high-risk” list for the first time in 13 years. At the Transforming Lives Gala, GSH will also honor the Meyer Foundation and Phil Rosenthal with its annual Philanthropy Awards. The Meyer Foundation is a family foundation supporting multiple human services and housing providers in the Greater Washington, D.C. area. Established in 1944 by Eugene Meyer, the publisher of the Washington Post, the Meyer Foundation has focused on several initiatives to bolster the capacity of local nonprofits, help to alleviate poverty, and improve the delivery of human services to those most in need. Over the years, the Meyer Foundation has partnered with GSH to extend the organization’s services, mission and reach into the Greater Mount Vernon community. Phil Rosenthal, the president of Nationwide Credit Corporation in Alexandria, has not only been a long-time donor for GSH, but has also served on its board of directors, as well as Resource Development and Gala Committees. In recognition of his many contributions to the Northern Virginia community, Rosenthal will also be recognized with the Fairfax County Citizen of the Year Citation of Merit from the Fairfax Federation in Merrifield on April 3. Former GSH Board President Rosemary Murray will also be recognized with the Joseph T. Adinaro Humanitarian Award. Murray has been a supporter of GSH for over a decade. Murray was actively engaged in the formation of and the recruitment of members for GSH’s Community Leadership Council (CLC), an advisory board that brings together members of the business community, faith community and local government.